Technology, and its role in fighting illegal, unreported, and unregulated (IUU) fishing in the Coral Triangle, was a focus of the 3rd Coral Triangle Fishers Forum in the Philippines. WWF experts discuss options, ranging from social media and technical training to the latest blockchain approach. GPS tracking devices, electronic logbooks, solar-powered data collection, and the new blockchain supply chain traceability—these were some of the technological innovations in the war against illegal, unreported, and unregulated (IUU) fishing which were cited at the 3rd Coral Triangle Fishers Forum (CTFF) held in Iloilo, the Philippines in 2017. Attended by some 120 participants, from fisherfolk and fish processors to technology providers and fisheries experts, the forum included objectives such as sharing experiences and knowledge on IUU reduction and traceability in the Coral Triangle, as well as presenting opportunities for pursuing successful models. Still, scaling up the piloting of innovative technologies, such as electronic traceability systems, electronic catch documentation systems (CDS), and electronic observer systems, while still adapting to an area’s needs, is a necessity, considering the volume of information to be dealt with in fisheries. 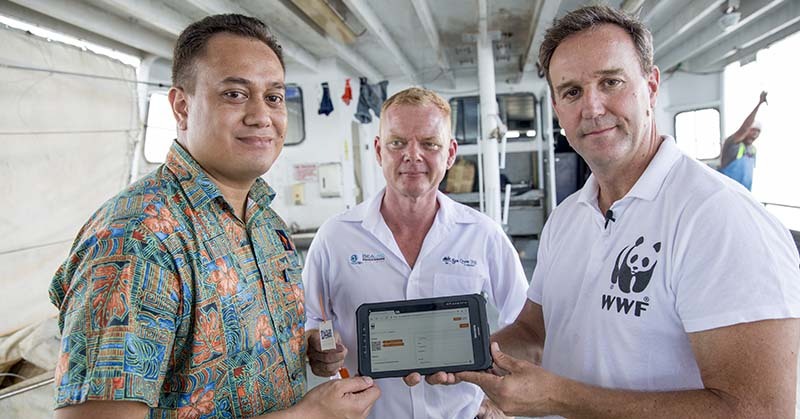 That’s the impetus behind the Blockchain Supply Chain Traceability Project, a joint initiative of WWF-New Zealand, WWF-Australia, and WWF-Fiji, working with software technology company ConsenSys, information and communications technology (ICT) implementer TraSeable, and tuna fishing and processing company SeaQuest Fiji Ltd. The project was launched recently in Fiji, where blockchain technology is being trialled to trace the supply chain of SeaQuest Fiji’s fresh and frozen tuna. A blockchain can be described as a virtual, digital ledger that is widely distributed and decentralized. “Very simply, a combination of electronic devices is used to capture information, which starts when a fish is first caught,” explains Williams. “A sensor or tag is affixed when the fish comes on board the vessel, which follows the fish and registers automatically at various scanning devices positioned on the vessel, at the dock, and in the processing facility.” Once the product enters the processing facility and is processed into various products, it will get another tag that will feed information into the same blockchain, thus tracking the product to its “ultimate fate,” Williams says. Like any new technology, while blockchain holds promise in addressing issues of supply chain transparency and traceability, it has yet to live up to the hype surrounding its recent introduction. As a result, some critics insist that blockchain is a long way from solving the problems of seafood traceability and, by extension, IUU fishing. Symington believes, however, while blockchain is a great idea, it may be better to make full use of proven and working technologies first, as well as to tackle more basic issues, such as ongoing awareness-raising on IUU issues. “This is about first securing a strong level of political will and industry buy-in, and also ensuring that the IUU issue is addressed in a multi-sectoral way across all relevant agencies. SeaQuest Fiji chief executive officer Brett Haywood (centre), with TraSeable Solutions founder and managing director Kenneth Katafono (left) and WWF Australia chief executive officer Dermot O'Gorman.